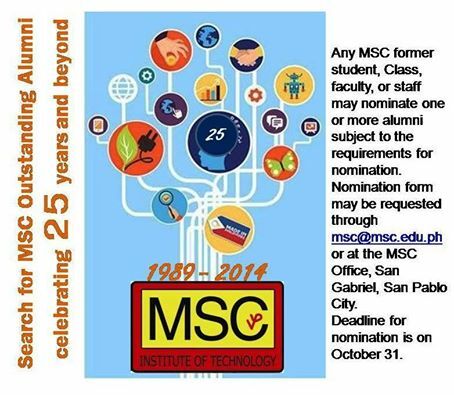 We will celebrate the 25th Anniversary of VYP-MSC Institute of Technology with a week long series of activities, culminating with the MSC Alumni Homecoming and Awarding Ceremonies for the MSC Outstanding Alumni. *All activities shall be held at the green school campus of MSC at San Gabriel, San Pablo City, except for the basketball games. This entry was posted in Alumni, High School, MSC and tagged 25 MSC, 25th foundation activities, 25th Foundation Day, Math Made So Cool, MSC, MSC High School Got Talent, outstanding alumni, Sayawit on November 23, 2014 by Jose Adonis Duma.